Ryan Michaleski is a partner in the Philadelphia office of Lewis Brisbois and a member of the General Liability and Long Term Care and Elder Law Practices. Ryan is also a member of the 24/7 Rapid Response – On Call Transportation team. Ryan focuses his practice on advising insurers and healthcare providers in the defense of complex liability and high exposure cases. Ryan's ability to think critically and examine issues with efficiency and from multiple angles, as well as his specific attention to detail allows him to effectively defend his clients’ interests and keep them thoroughly advised throughout the litigation process. Ryan has extensive experience defending insurers in complex general liability matters, including products liability, sexual abuse, premises liability and motor vehicle accident litigation. Ryan also has a depth of experience in the defense of long-term care and assisted living facilities. 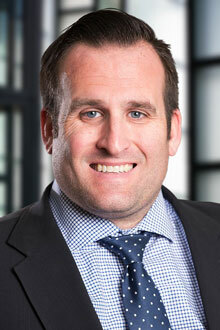 Ryan is a Certified Arbitrator for the Philadelphia County Court of Common Pleas. Ryan has served as a law clerk to the Honorable Charles A. Little of the Superior Court of New Jersey - Camden County, Civil Division. He is also a graduate of the International Association of Defense Counsel Trial Academy. In 2016, 2017 and 2018, Pennsylvania Super Lawyers named Ryan as a Rising Star in the area of General Insurance Defense, an honor reserved for only the top 2.5% of attorneys in Pennsylvania under the age of 40. Lewis Brisbois recently obtained summary judgment on behalf of a psychologist and her practice in a medical malpractice action.